Scroll down to see our selection of Otoscopes and Ophthalmoscopes for sale. Otoscopes and ophthalmoscopes are used by doctors to examine the eyes and ears of a patient. We carry a selection of otoscope and ophthalmoscopes including diagnostic kits, fiber optic otoscopes, standard otoscopes and ophthalmoscopes as well as economic models for general use. 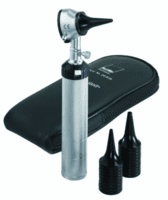 Otoscopes and ophthalmoscopes are medical devices used by health care professional during regular check ups. Otoscopes and ophthalmoscopes help in the screening of illness and also to investigate when a symptom involves the ear or eyes. Consisting of a handle and a head, otoscopes and ophthalmoscopes contain a light source and a low power magnifying lens. Simple, light weight and portable otoscopes and ophthalmoscopes are crucial in determining the health of your patients..